Welcome, dear visitor, to our Library, currently a work in progress. 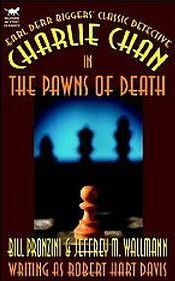 Here, you will find information on many books that relate to detective Charlie Chan. Charlie Chan made his first appearance in print in the January 24, 1925 issue of The Saturday Evening Post. In this magazine, the first installment of The House Without a Key by Earl Derr Biggers ran for a month. 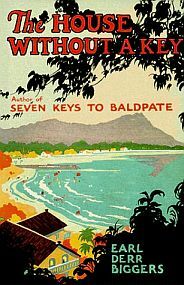 Soon thereafter, this adventure was offered in book form, which began the appearance of numerous books over the decades which continues to this day. 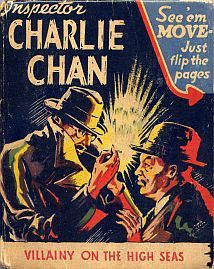 What follows is a humbly offered collection, in a chronological format, of most of the books that have been published containing either stories of material directly related to Charlie Chan. As well, some other books that have another, less direct connection, will be added. 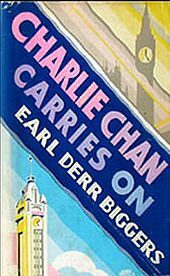 We begin with the six original tomes by Earl Derr Biggers that contained Charlie Chan's original adventures. As we note below, these stories have been re-published by numerous companies over the years in just the United States. However, the honorable Mr. Chan's adventures have also been printed in other countries around the world, including, but not limited to, Canada, Great Britain, France, Germany, Italy, Spain, Sweden, and the land of Charlie Chan's ancestors...China! In this first adventure, penned by Earl Derr Biggers, Charlie Chan solves a mystery involving a murder that occurs in his own Honolulu. 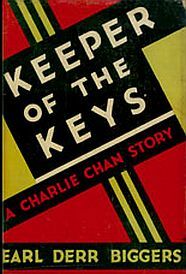 This story's popularity led to its being adapted to a 10-episode film serial, The House Without A Key (1926), starring George Kuwa as Chan. 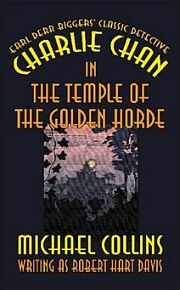 In 1933, Charlie Chan's Greatest Case, starring Warner Oland, sprang from the pages of this book. 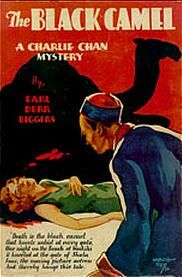 Earl Derr Biggers' second Charlie Chan novel took the detective to the California desert where he uncovers the reason for the mysterious disappearance of a millionaire. As was true of the first Charlie Chan mystery, this story led to another film, The Chinese Parrot (1927), which featured George Kuwa as the detective. In 1934, Warner Oland starred in Charlie Chan's Courage, which was adapted from his book. 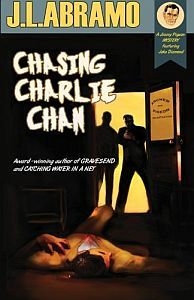 Biggers' third book in the Charlie Chan series involves the detective in a case that spans decades and continents, culminating in the city of San Francisco. 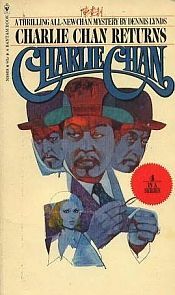 This novel provided the basis for the first "Charlie Chan" film to come out of Fox Film studios, Behind That Curtain (1929), a "talkie" featuring E.L. Park, whose Chan appeared onscreen for but a few minutes toward the end of the movie. This Biggers story was later the inspiration for two other Charlie Chan movies, Charlie Chan's Chance (1932) and Murder Over New York (1940). The death of Hollywood actress Shelah Fane in her Waikiki beach house brings Charlie Chan of the Honolulu police to seek the identity of the killer. 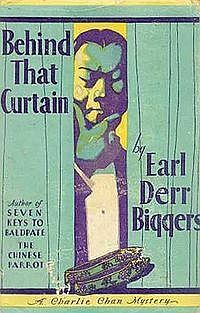 This was the fourth of Earl Derr Biggers' books in the Charlie Chan series. The film of the same name, produced by Fox Films in 1931, starred Warner Oland as Charlie Chan. The fifth of the Earl Derr Biggers Charlie Chan books books involves the Honolulu detective in a case of murder that stretches around the world, as members of a tour group are dying, one by one. Chan carries on for a fallen collegue as the tour reaches Honolulu. 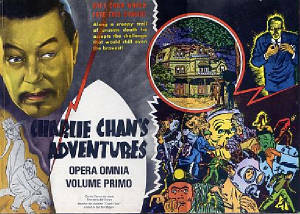 The Fox film Charlie Chan Carries On, the first movie in the Chan series, proper, starred Warner Oland as Charlie Chan. 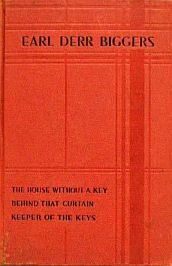 Keeper of the Keys was the final book written by Earl Derr Biggers before his passing a year later. In this last written adventure, Charlie Chan travels to Lake Tahoe in California, soon becoming embroled in a case of murder there. No film was ever based on this book, while brief elements may be detected in Charlie Chan in Reno (1939). This collection includes The House Without a Key, Behind That Curtain, and Keeper of the Keys. 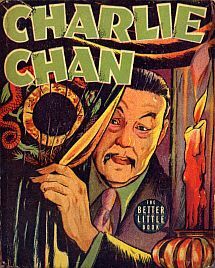 Between 1939 and 1942, a series of three "Better Little Books" featuring adventures of Charlie Chan. These tales were adapted from the Chan newspaper comic strips that were produced by noted cartoonist Alfred Andriola. Measuring 3 5/8 by 4 1/2 inches, each book contained a complete story with alternating pages of imagery and correcponding text. These Chan adventures were also issued in a Spanish language version. 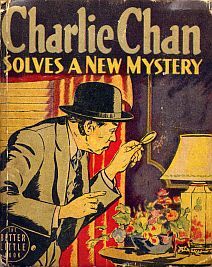 In London, Charlie Chan seeks to locate a kidnapped scientist who has developed a formula for "Dark Light," something that would allow spies from other countries to photograph anything through an invisible screen. 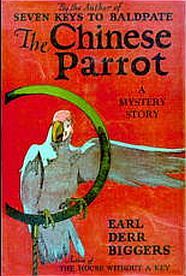 Charlie Chan works to solve a murder committed aboard the ship he is sailing on, with the victim's talking macaw offering a valuable clue. An unnamed European nation seeks to create a means to reverse the Gulf Stream, thus defeating the United States by altering its climate. 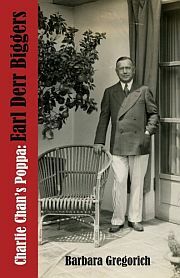 This book features a compilation of indexed aphorisms as collected from the 21 Charlie Chan films from Twentieth Century-Fox that were featured at the Museum of Modern Art in New York City from March 4-17, 1968. Interestingly, a few sayings from the "lost" Charlie Chan movies appear as well. 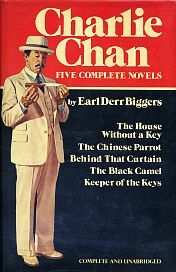 In 1974, Bantam Books released a full set of the six Charlie Chan novels written by Earl Derr Biggers. A seventh book, containing a new, original story penned by Dennis Lynds, was added to the set. In 1976, two volumes of Charlie Chan comic reprints were issued through a collaboration between American and European comic art collectors. Both volumes featured Chan comics by noted artist Alfred Andriola which ran in newspapers throughout the United States and Canada between 1938 and 1942. Evidently, a total of five such volumes were planned, but the final three were never issued in the same format or quality. A "Volume 3" (of lesser production quality) was later released by Pacific Comics Club and is described below. Contained in this well-produced volume are the daily strips for the Charlie Chan newspaper comics by Alfred Andriola. Included are "dailies" that originally appeared between October 24, 1938 and November 18, 1939. In this volume, also well-produced, are the Sunday strips for the Charlie Chan newspaper comics by Alfred Andriola. Included are three-color reproductions of the strips that originally appeared between October 30, 1938 and March 17, 1940. Also offered are daily strips (presented in three-color format) that ran from November 20, 1939 and March 20, 1940. "They call her the Dragon Queen, a woman of impenetrable mystery and unknown powers. Then someone makes the fatal mistake of putting her in jail for murder. Years later, San Francisco is paralyzed by a wave of the most bizarre killings ever documented, each more unspeakable than the last, each devoid of clues, at least to Western eyes. There is only one man who stands a chance of outsmarting the killer - Charlie Chan." 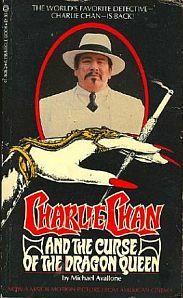 This book contains a story that was an adaptation of the Charlie Chan feature movie "spoof," Charlie Chan and the Curse of the Dragon Queen. Contained within this handsomely produced volume are five of the six Charlie Chan adventures by Earl Derr Biggers. Included are The House Without a Key, The Chinese Parrot, Behind That Curtain, The Black Camel, and Keeper of the Keys. 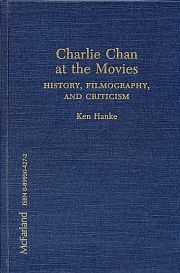 In his extensive study of Charlie Chan films, the first such compilation of research focusing specifically on Charlie Chan and Charlie Chan movies, Ken Hanke offers detailed information on the films as well as their place in history. In gathering information for his book, Mr. Hanke interviewed Keye Luke, who appeared on-screen as Chan's Number One Son, Lee. Mr. Luke's insights are interspersed throughout the book, offering an interesting perspective. 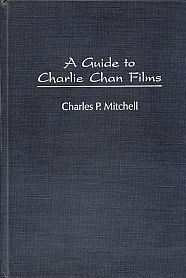 Ten years after the release of Ken Hanke's compendium of Charlie Chan films and related information, Charlies Mitchell offered a book that, though similar in genre, offered new insights into both Charlie Chan and the films featuring the globe-trotting detective. Not only are the movies from the series proper presented, but many other Chan pictures, including foreign-made films. Throughout the book, Mr. Mitchell describes as well as rates the movies. 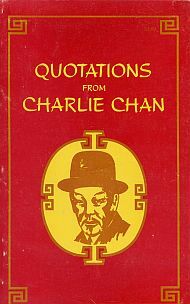 Also, the aphorisms stated by Charlie Chan are included. This was a highly anticipated book by Dr. Howard Berlin. 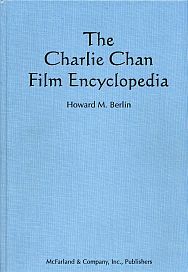 When it became available, fans of Charlie Chan were treated to a collection of information on the detective and his movies that remains unsurpassed. Everything from A to Z, from the widely known to the trivial, is contained within the covers of this fascinating and most informative volume. "A collection of 600 proverbs spoken by the cinema's favorite Oriental detective." 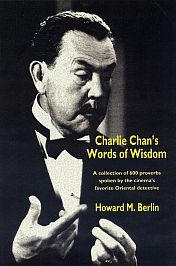 Dr. Berlin organized Charlie Chan's aphorisms by film, including a cast list for each of the movies. After each saying is a note indicating the context of the proverb, noting the individual to whom the statement was directed. The following two books each contain a selection from the four "Charlie Chan" stories that appeared in the short-lived Charlie Chan Mystery Magazine, four issues of which appeared between November 1973 and August 1974. These stories featured an "updated," anachronistic Charlie Chan who solved crimes in the 1970s. The Temple of the Golden Horde (from the May 1974 issue) and The Pawns of Death (from the August 1974 issue) were penned by Bill Pronzini and Jeffrey M. Wallmann who wrote under the pseudonym of Robert Hart Davis. "Alive, he had been an innocent courier. Dead, he plunged Charlie Chan into perhaps the deadliest game of murder in his distinguished career as he sought the terrible secret of - The Temple of the Golden horde." "Not one, but two murders committed in two locked rooms of the luxurious Hotel Frontenac in Paris! 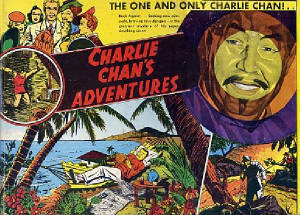 It challenged all of Charlie Chan's ingenuity. He sought to unravel the tangle of calumny, hate and twisted ambitions, with his only clue the whispered word from the halting lips of a dying reporter." 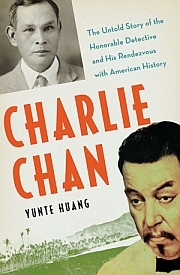 In this book, Yunte Huang has traced Charlie Chan's evolution from island legend, detective Chang Apana, to cultural icon to vilified, postmodern symbol, ingeniously juxtaposing Apana's rough-and-tumble career against the larger backdrop of a territorial Hawaii. 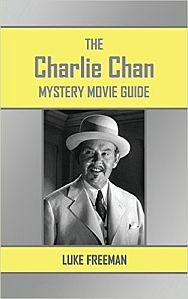 The Charlie Chan Mystery Movie Guide features a detailed commentary, analysis, and review on each of the Charlie Chan films produced by Twentieth Century-Fox, including character studies and a detailed exploration of the themes and philosophies prevalent through the series as well as cast lists and plot synopses. The author also offers new take on the age-old Oland vs.Toler debate. 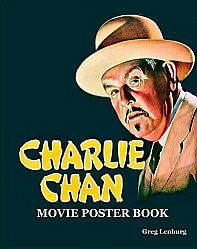 The Charlie Chan Movie Poster Book presents posters and poster art from Charlie Chan films from 1931-1949 featuring Warner Oland, Sidney Toler, and Roland Winters. Also included is the mystery/spoof Charlie Chan and the Curse of the Dragon Queen (1981) starring Peter Ustinov. As a sixteen-year-old, Barbara Gregorich discovered the Charlie Chan novels of Earl Derr Biggers on the "local authors" shelf of the Warren, Ohio Public Library. She fell in love with the wisdom, humor, and perceptiveness of the amiable Chinese-Hawaiian police detective, and she admired the author who created him. Wanting to know more about Earl Derr Biggers and how he came to write his mysteries, Barbara Gregorich researched the Bobbs-Merrill Archives at the Lilly Library, Indiana University, Bloomington. There she read all the correspondence between Biggers and his editor — correspondence which brings to life the author’s struggles to satisfy the Chan-hungry public. 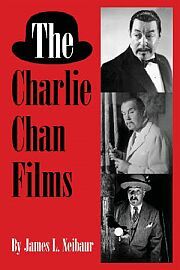 This book offers a look at all of the films in the Charlie Chan series, including early ones that are now lost, examining each movie in context. Common themes, critical assessments, discussion of the director and the actors, period reviews, production information, and recollections from those who appeared in the films are all included. 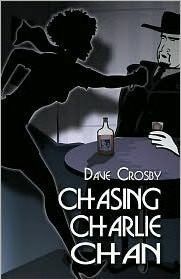 Charlie Chandler is a young female cop who has earned a promotion to detective. It's her dream come true since her late father and grandfather were both detectives. Both Charlie and her father were great fans of the old Charlie Chan movies, so she applies the wisdom and sayings of the old movie character as she tackles a new murder case with her new partner, Officer Mitchell Yen, a young man of Chinese ancestry. 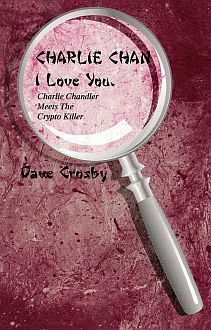 In the second book of this short-lived series, Charlie Chan I Love You (Charlie Chan Meets the Crypto Killer), Detective Charlie Chandler and her partner, Mitchell Yen, have three new cases as the first detectives assigned to the cases have struck out. 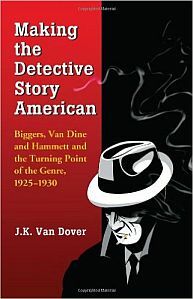 This book examines the fiction of Earl Derr Biggers, S. S. Van Dine, and Dashiell Hammett during a crucial half-decade when they transformed the detective story and the characters they created, including Charlie Chan, Philo Vance, and the Continental Op. Private detective Jimmy Pigeon is determined to discover who killed his friend and partner, Lenny Archer. He may have to learn what became of the actor who portrayed Charlie Chan in the thirties, and who assassinated a charismatic mobster in the late-forties, before he can identify Archer's killers. 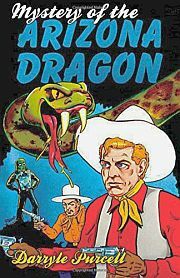 When PR man Curly Woods and cowboy Hoot Gibson arrive at an Arizona dude ranch they find themselves up against a supervillain with a deadly weapon. Sent by the studio to teach Warner Oland, Keye Luke, and the rest of the cast of the new movie, "Charlie Chan Goes West," how to ride, Woods and Gibson find themselves in the midst of a situation that makes the film's plot sound like a kiddie story. Who is the mysterious "Dragon" and why is he killing horses, ranchhands, and plotting a mass slaughter of miners? And, most of all, why is he so determined to end our heroes' lives by any means necessary? Suspects include the film's stars, Oland and Luke, its German immigrant director, a cowboy actor who can't ride, a blonde getting her first big break outside of comedy shorts, the ranch's beautiful but mysterious redheaded owner, and a bevy of Hollywood hopefuls. Dust Bowl refugees, Arizona ranch hands, aerial battles, shootouts, underground traps and living creatures gathered and released as weapons, spice up the action. 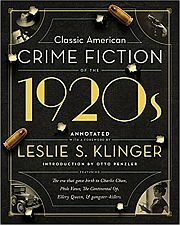 An annotated anthology containing five classic crime novels including a Charlie Chan mystery, The House Without a Key, by Earl Derr Biggers.